I never really thought about why a company choses a colour over another one for their logo. 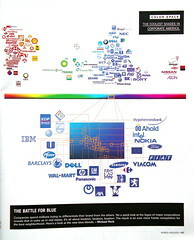 However, this picture does seem to indicate that a lot of companies are thinking along the same lines. Thanks to Phil Gyford for the image! This entry was posted in image, organisation, trivia and tagged colour, corporate, flickr, image, logo, organisation, trivia by tevirselrahc. Bookmark the permalink.